Having learned from their rather lacklustre first generation launches in the UK, Daewoo made a point of prioritising sophistication going forward. While an improvement on its predecessor the Nexia, the used Daewoo Lanos is still distinctly average in everything except value for money, where it excels. With this market sector already packed with well regarded competition, Daewoo sensibly kept it simple, the Lanos being made available with three trim levels – the S, SE and SX, two engines – a 74bhp 1.4 litre and a 1.6i and three body styles – three and five-door hatchbacks plus a four door saloon. The Daewoo Lanos was in production from 1997 – 2003 but is still a fairly rare sight on British roads. The used Daewoo Lanos is no supermodel but it is neat, reliable and inoffensive in appearance. The three-door entry-level S models are good value with basic equipment including twin airbags, side-impact beams, tinted windows, immobiliser and RDS stereo. The SE was available as both three and five-door, with body-coloured bumpers, metallic paint and a tachometer. The cheap Lanos SX range topper included all three body styles and the option of an automatic gearbox, plus electric front windows, air conditioning and tilt adjustable steering wheel. Summer 2000 saw a minor facelift, mostly involving improved trim and equipment specifications for the SE and SX models, such as a metallic effect fascia, nicer cloth seats and new wheel trim covers. The SX also got body coloured side-strips, wing mirrors and door handles, plus a spoiler on the three-door. 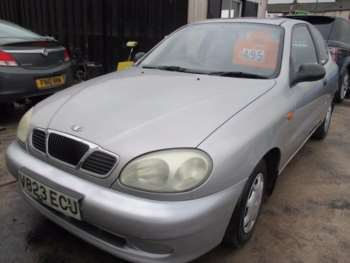 Prices start at £1,100 for an entry-level R-reg used Daewoo Lanos for sale. Knock off five years and you're still only looking at about £2,500 for a 2002 model, with the marginally plusher SE not much more. 1.6 litre SX saloons start at £1,200, with small premiums for the hatchbacks and another £200 for an automatic gearbox, going up to £3,000 for a 2002 five-door automatic 1.6 SX. No reported faults but, as always, aim for a full service history. Daewoo's generous after-sales package for new buyers along with its more mature client base means most used models should have been well cared for. Daewoo lacks the economies of scale that keep its major rivals competitive on parts prices, so you're looking at £235 for an alternator and £125 for a clutch assembly kit, £195 for a starter motor, £185 for a radiator and £45 for a set of front pads. Not eye watering but not the cheapest either, particularly if you then consider the price for a new exhaust system at £658 or catalyst at £345. While the used Daewoo Lanos for sale is a significant step up from the Nexia, it still lags behind market rivals such as the Astra, Focus or even budget competitor Skoda. A used Lanos simply isn't an exciting buy. However, as an everyday economy vehicle for those valuing function over form or practicality over style, the cheap Daewoo Lanos will safely and comfortably transport you from A to B. Definitely try to stretch to the 1.6 litre engine but even so don't expect handling, brakes or performance to be anything more than adequate.